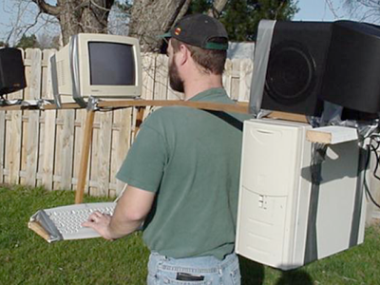 Is Mobile Computing Good Enough? This new “mobile computing” use case that smartphones try to serve is not going to be satisfied with solutions that are built from modular components. The reason is simple: as the solutions are not good enough (because it’s early days), they need to be improved. If they are to be improved, competitive pressure will compel those who try to do so as rapidly as possible. The fastest climb up the trajectory of performance will get the bulk of the benefits. Modular implementations are simply not fast enough in cycle time of iteration in comparison to the integrated approaches. This is why Apple will grow faster than Google, Nokia and Windows Mobile. How does this relate to the ecosystem? Many have been commenting that Google’s (or Nokia’s or Microsoft’s) ecosystems are more “open” or “flexible” with respect to Apple’s. And that in the long run that is the right architecture. That may be, however implementing loose ecosystems coupled loosely to modular devices and operating systems and services as a whole will not be competitive. They will be too late, too slow and too hard to use. They will be awkward to position and the benefits will be impossible to explain to end users. They will be sold through a distribution channel that is too long and with poor information feedback. Too many “vested” interests will dilute the product’s reason for being. The pricing of the integrated player will cause poor economies for the modular cohort. I could go on but it suffices to say that the modular approach will fail to be competitive. Ken and his peer group are implicitly and explicitly owned by the customers he tries to serve. What I mean is that Ken is hired by those who have the money but not the competence to think by themselves. His clients are the incumbent device vendors who are signaling to him that they will increasingly license Android (as they signaled that they will license WinMo before). He adds up all the signals he gets and multiples by random numbers to get a forecast. It’s a supply-side forecast assuming “Porter’s five forces” is still at work. In that sense, he is selling back to his clients what they’ve already told him. He is hired to validate their assumptions and that’s what he delivers. Rinse, repeat.